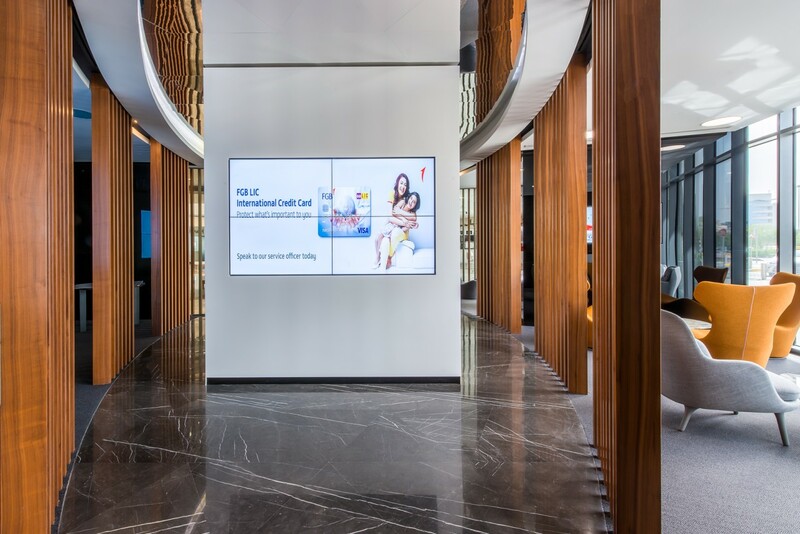 First Gulf Bank was the third largest bank by assets in the United Arab Emirates, operating out of a spectacular new headquarters building and retail bank in Abu Dhabi. 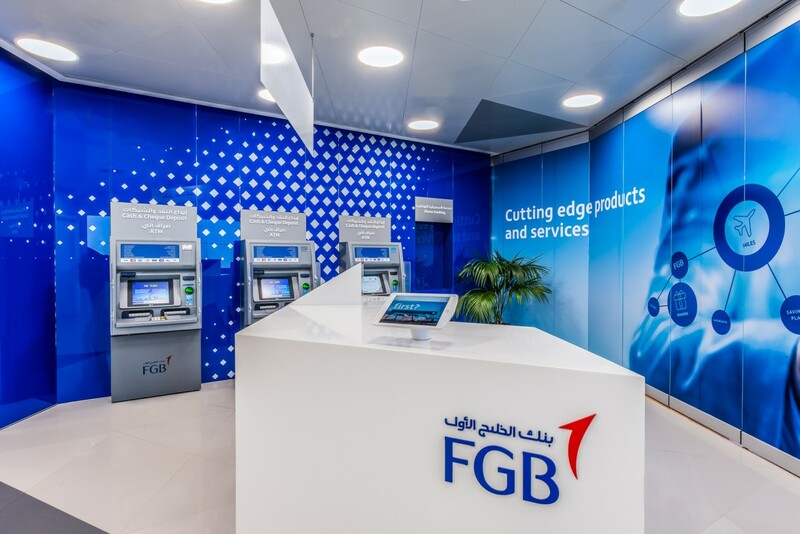 In 2017, FGB was part of a merger that resulted in the company being re-branded as First Abu Dhabi Bank. 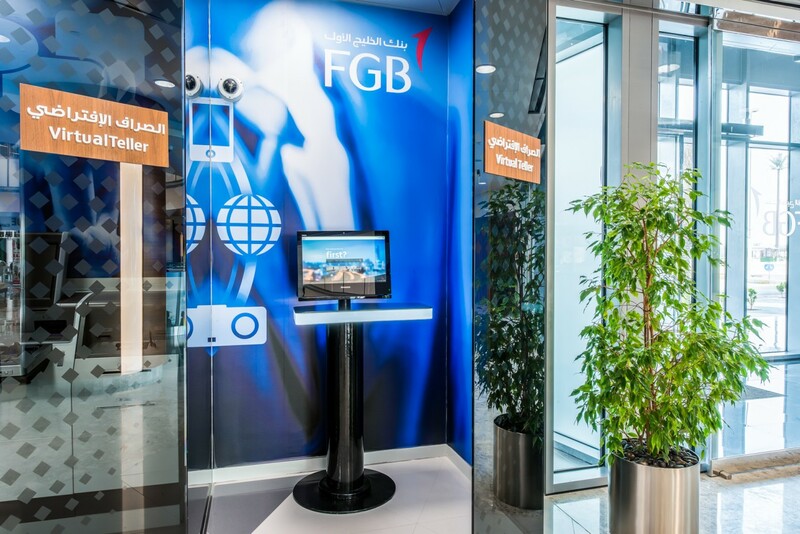 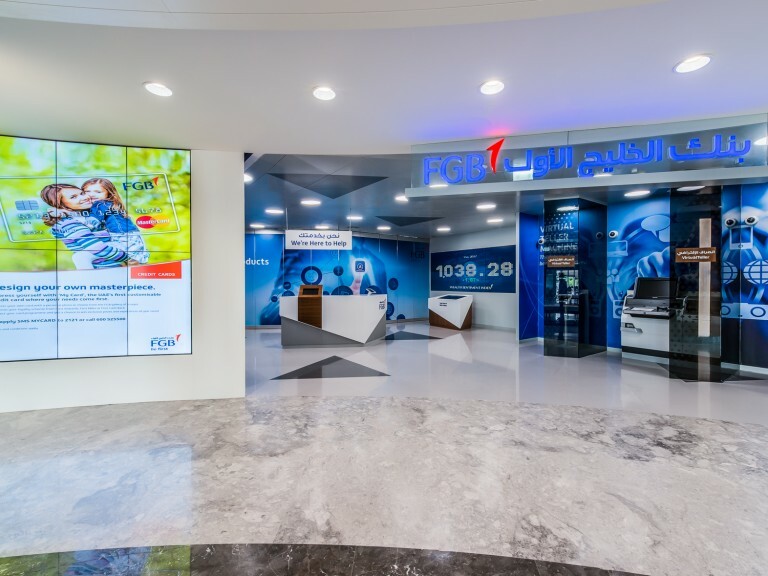 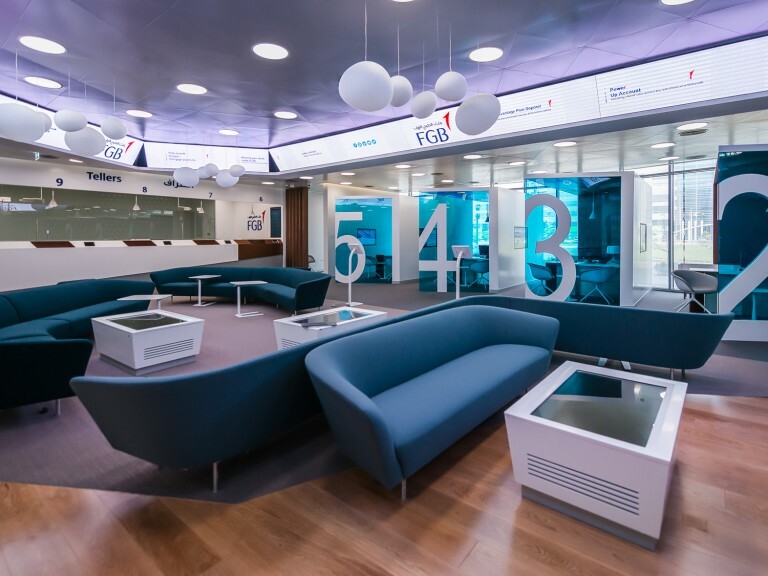 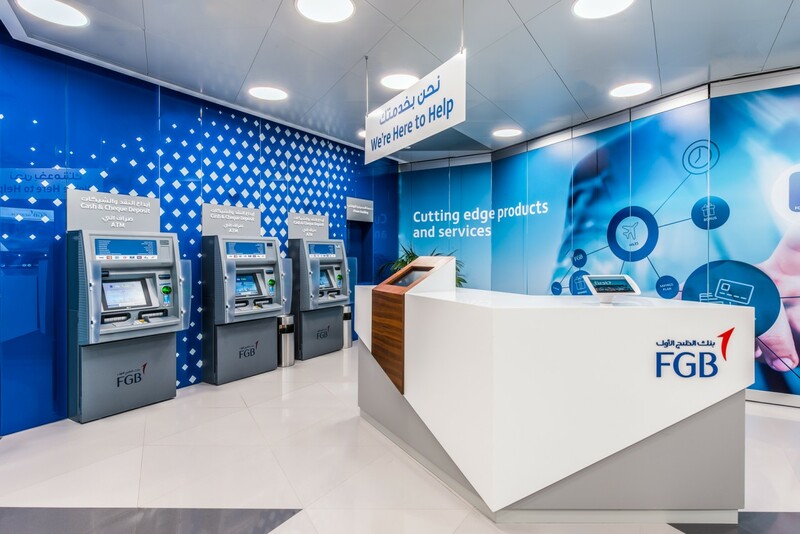 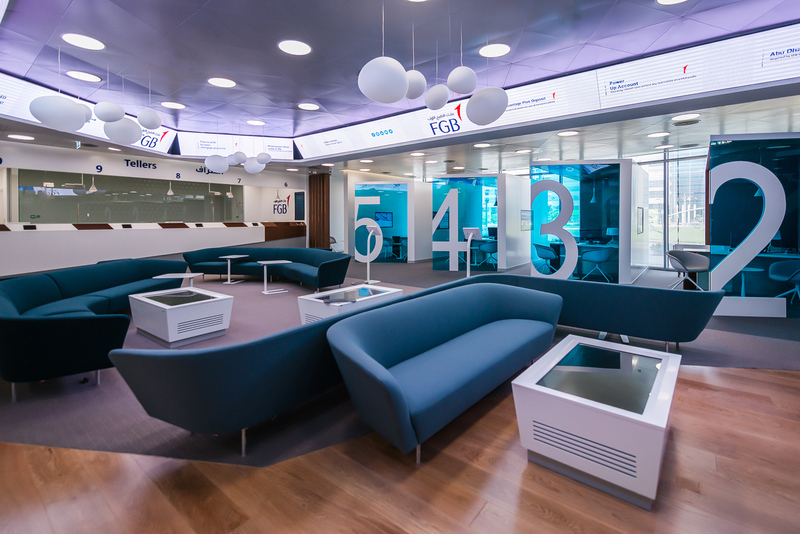 Prior to the merger, 2.0 Concepts was commissioned to do multiple digital signage roll-outs for FGB branches and brought in to equip FGB's head office with digital display technologies. 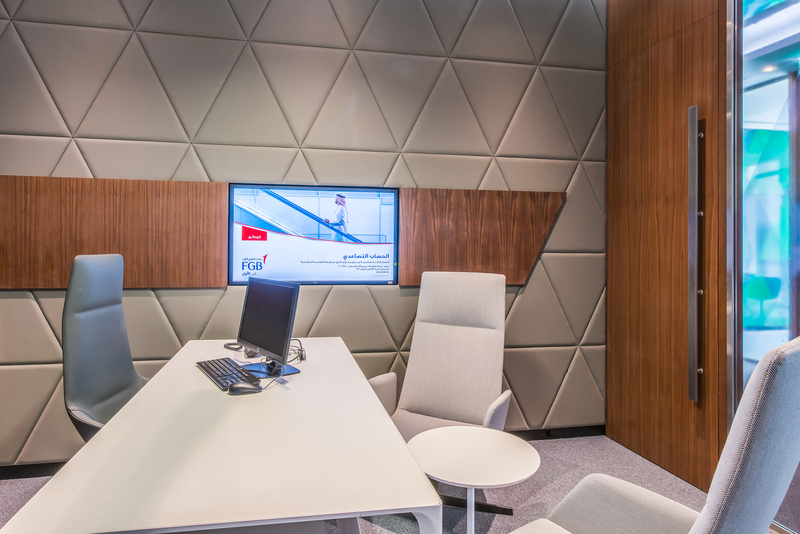 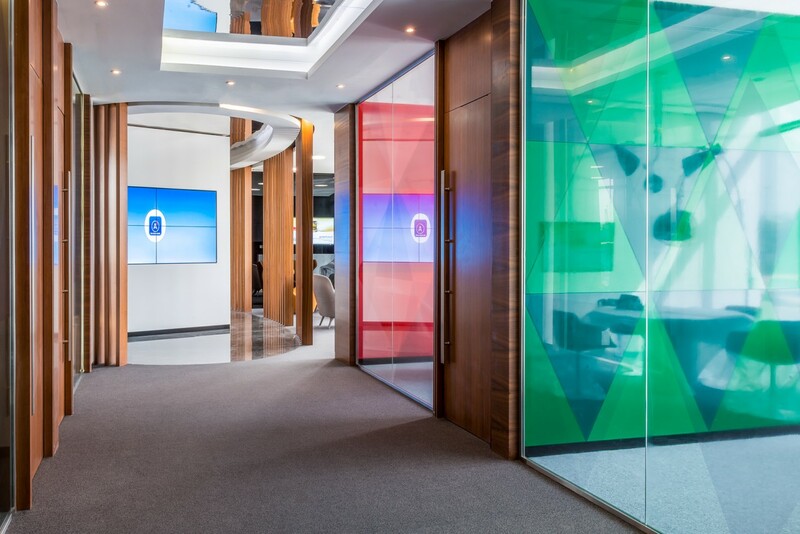 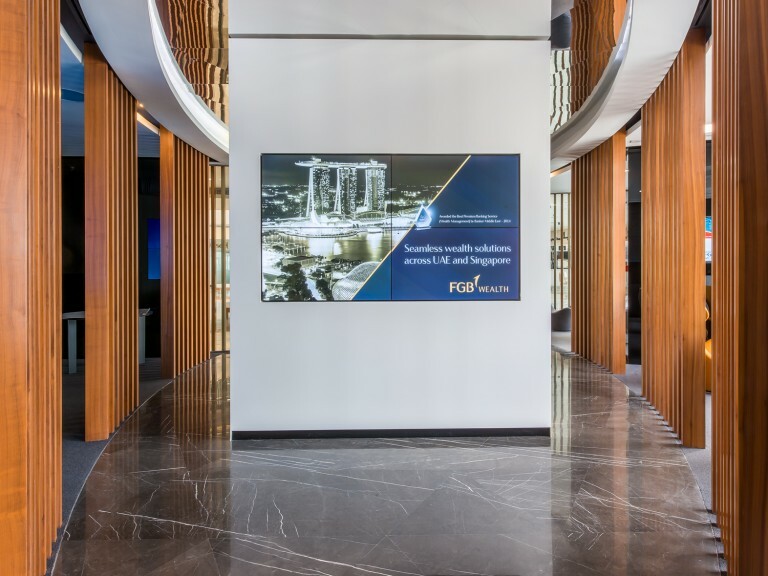 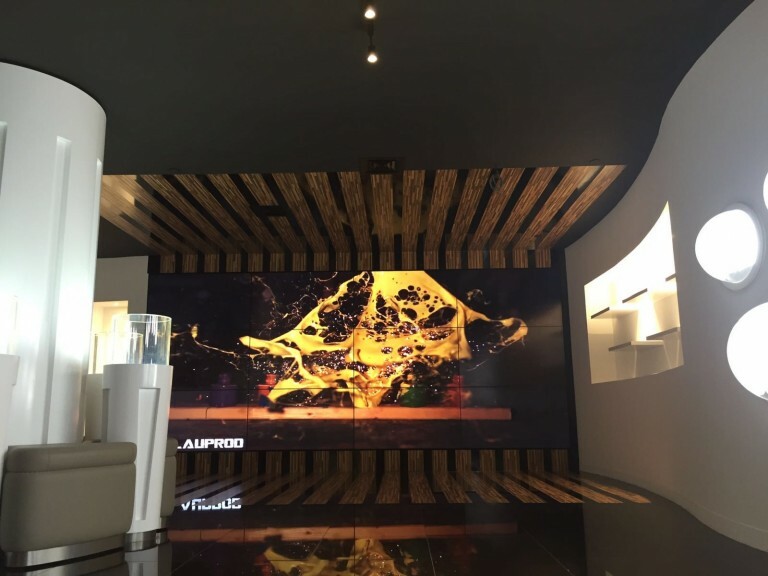 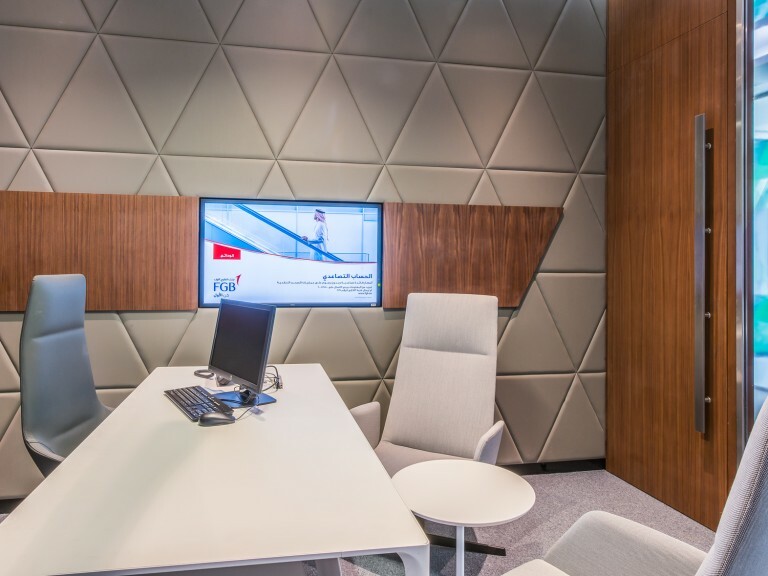 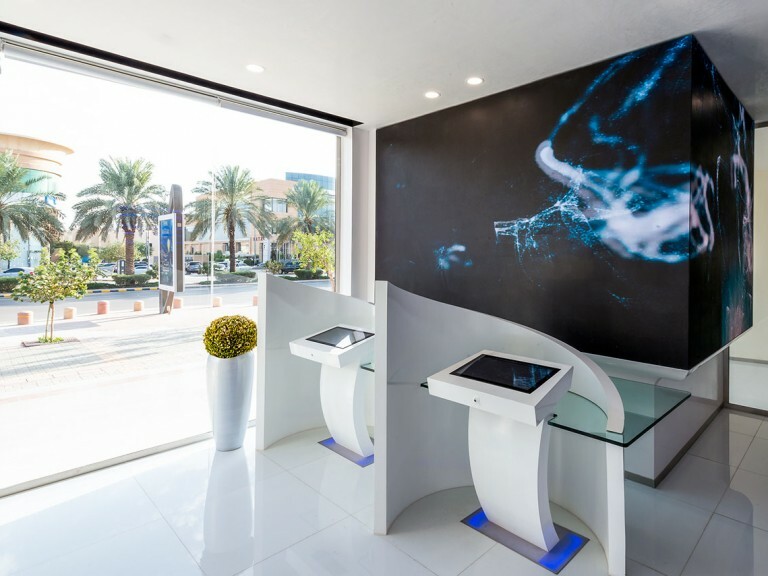 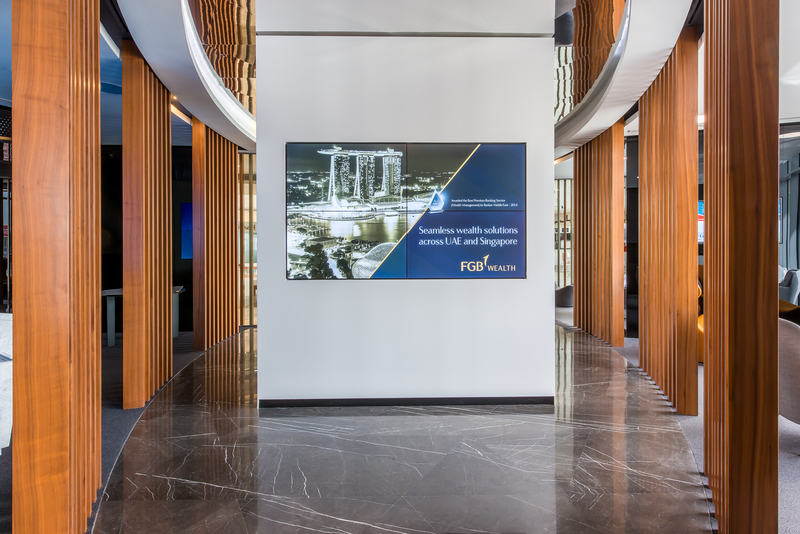 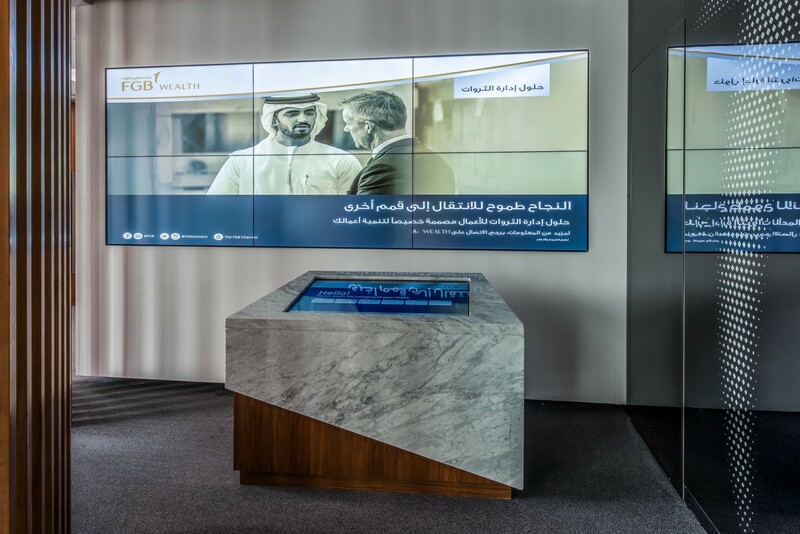 The Abu Dhabi headquarters branch is rich with innovative digital display options put together and installed by 2.0 and its partners. 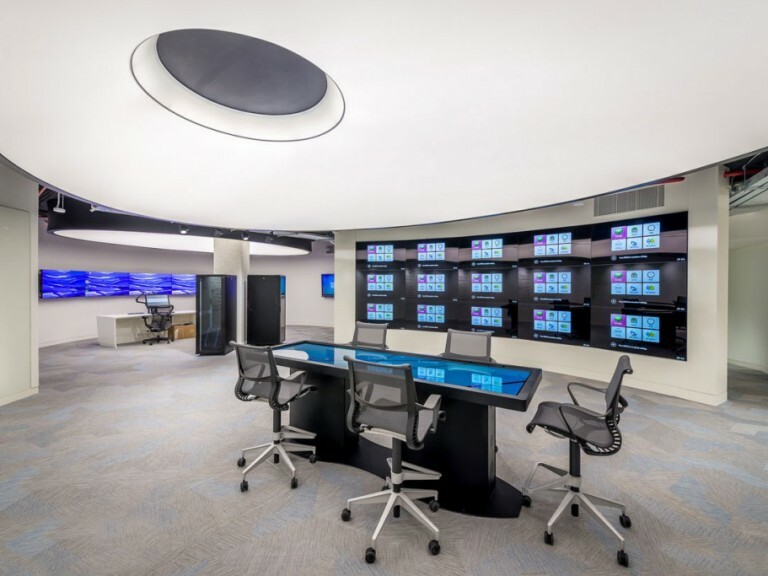 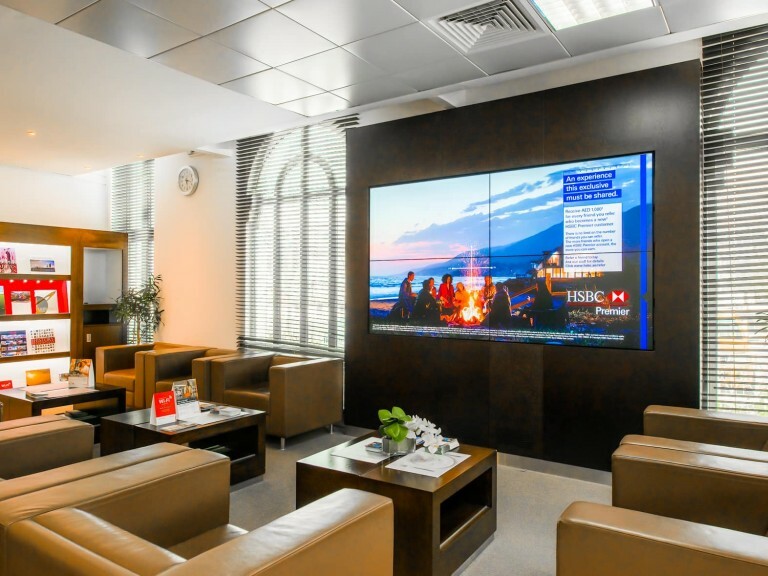 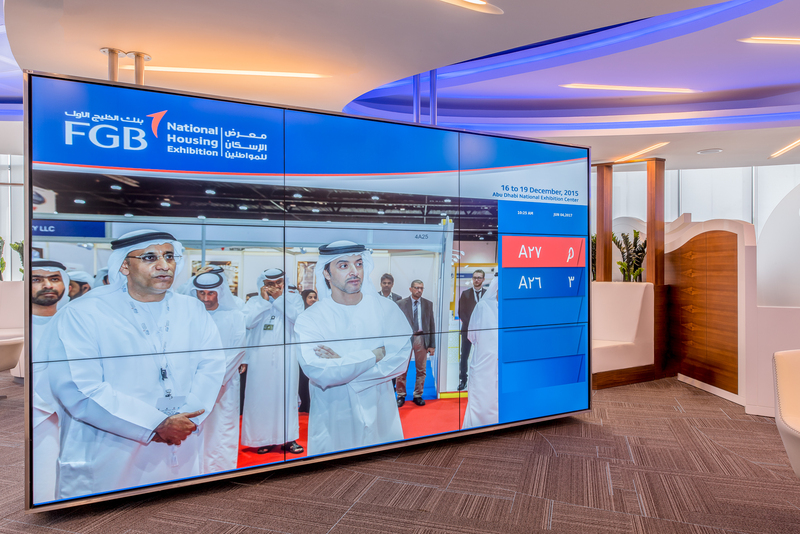 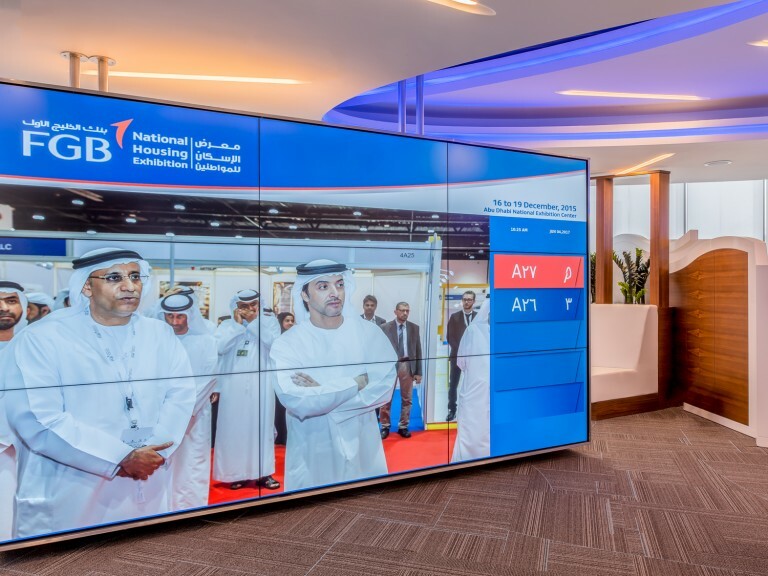 There are numerous video walls in the public banking and adjacent corporate areas, including a distinctive two-sided, three by three eye-level video wall in a lounge area. 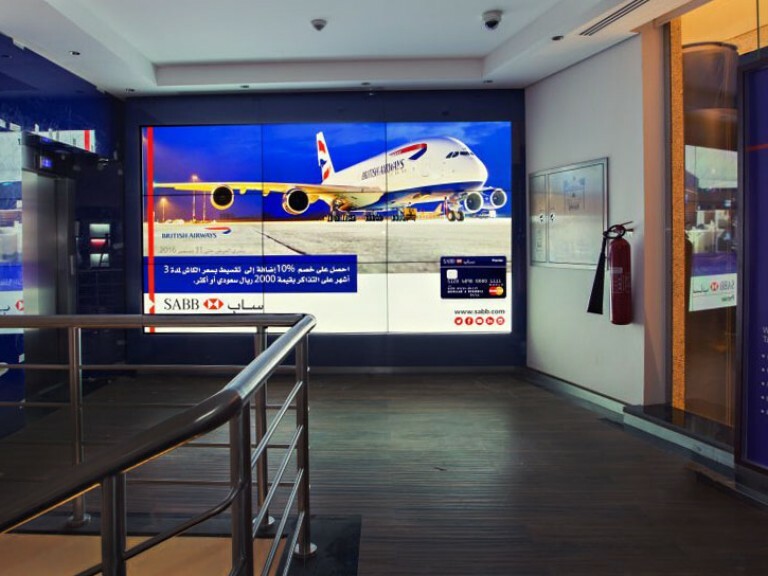 That display runs promotional content, but also doubles as a notification display for customers, integrated with a queue management system put in by 2.0. 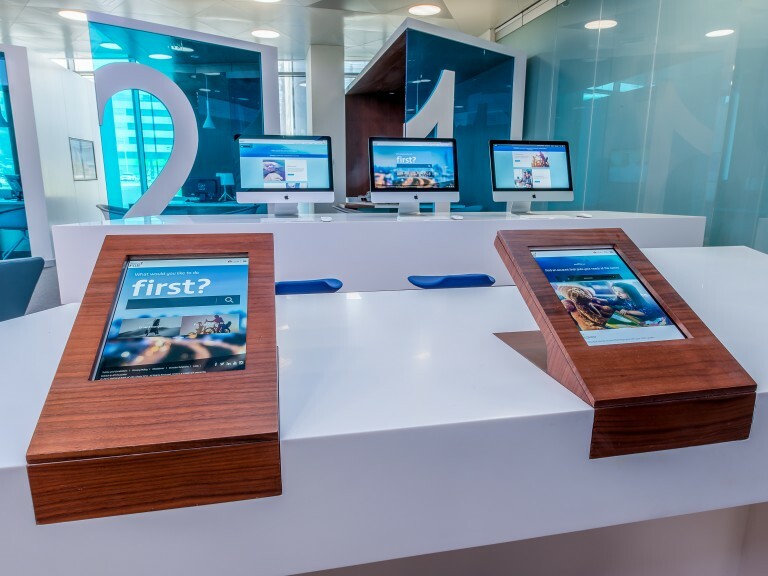 There are also interactive touchscreen tables at key decision and access points around the branch, available to customers needing self-directed banking information. 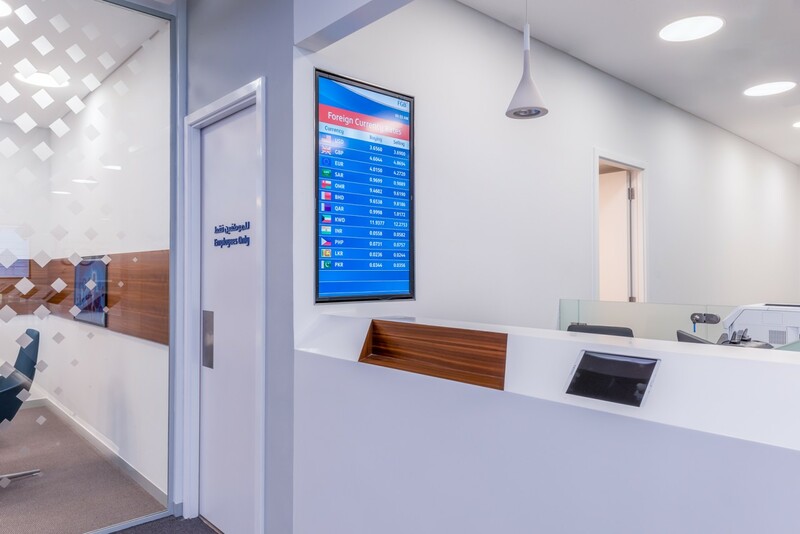 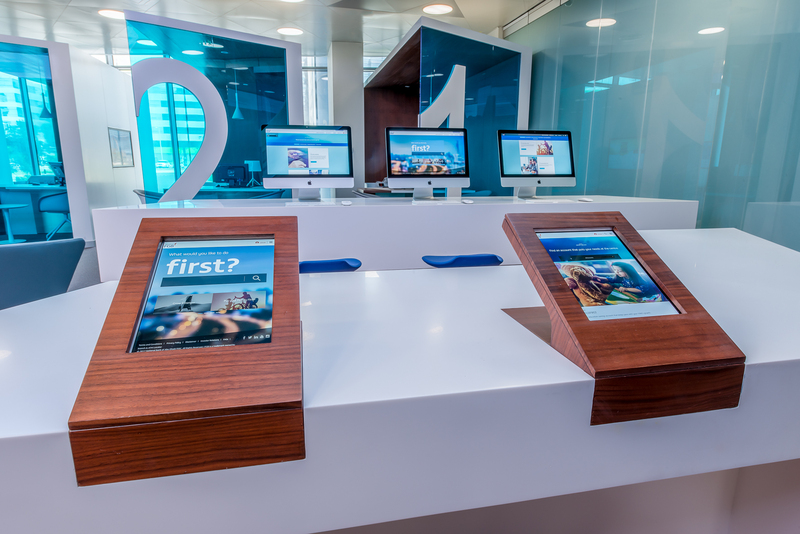 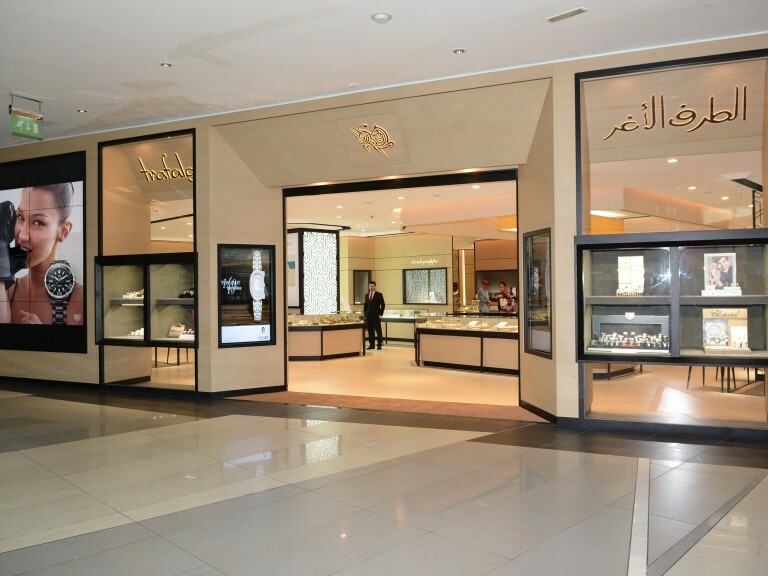 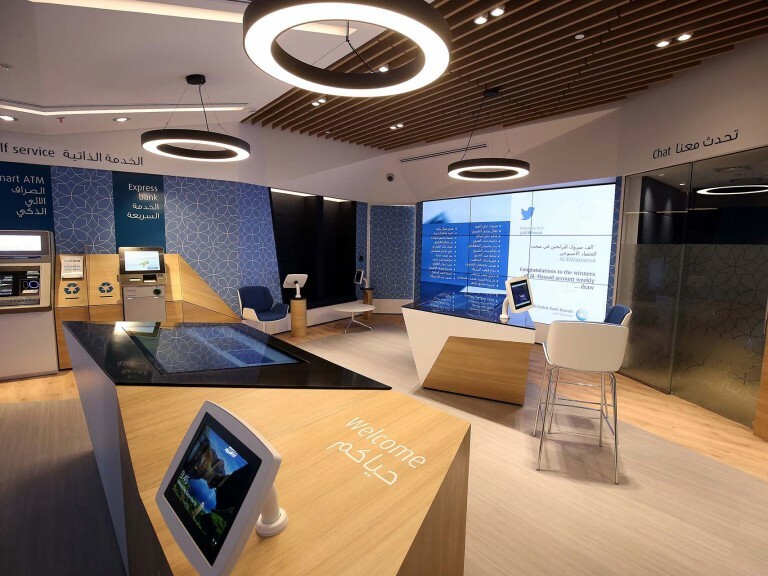 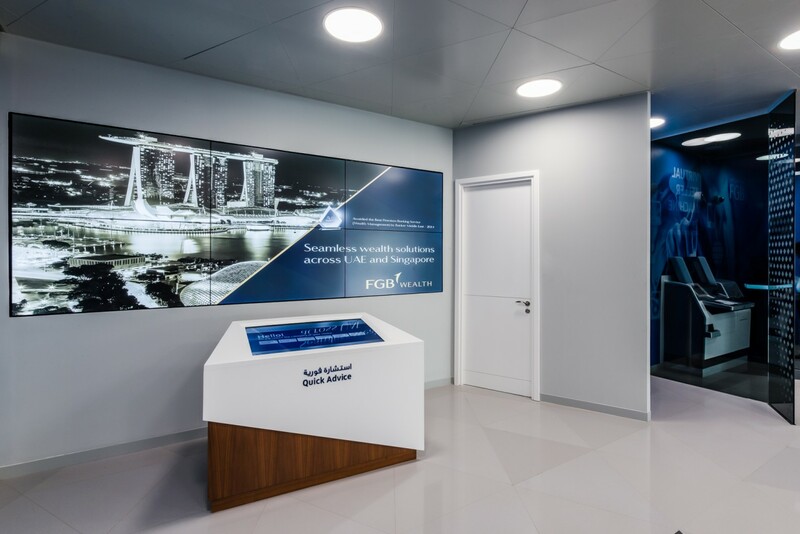 The retail areas of the bank branch includes two by three wide video walls that run bank branding messages, as well as key financial data, such as foreign exchange rates. 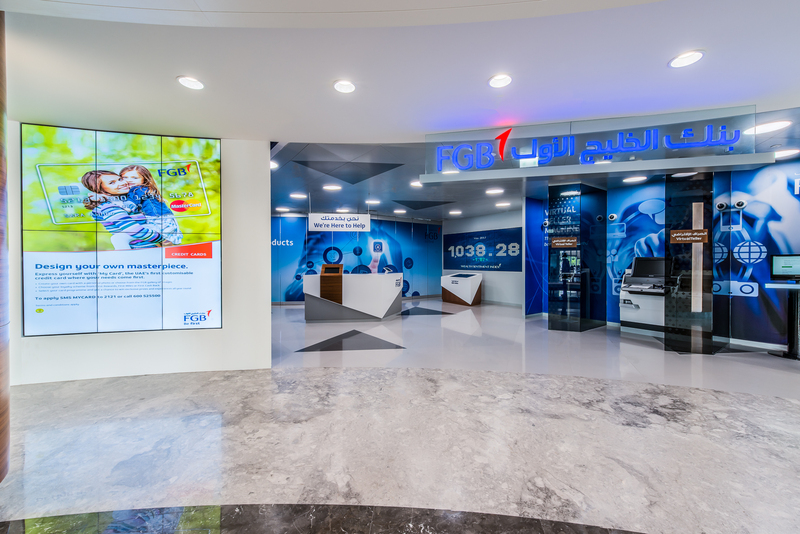 There are also separate, dedicated ForEx displays around the facility. 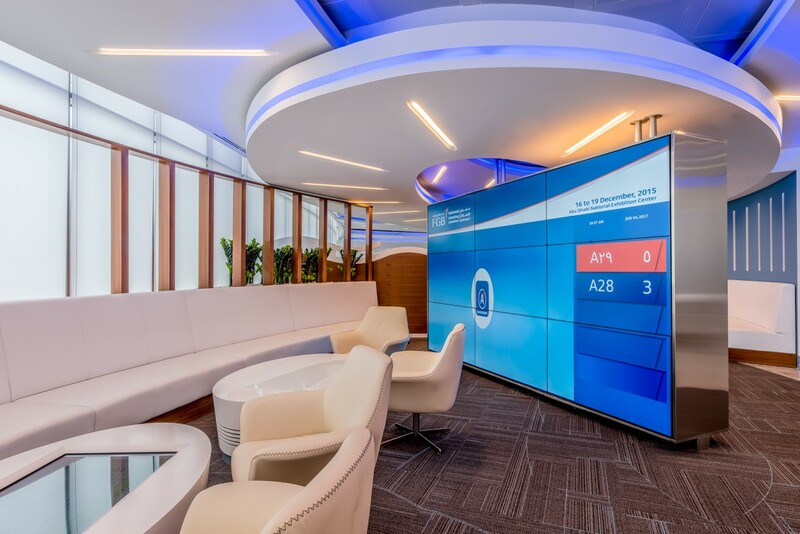 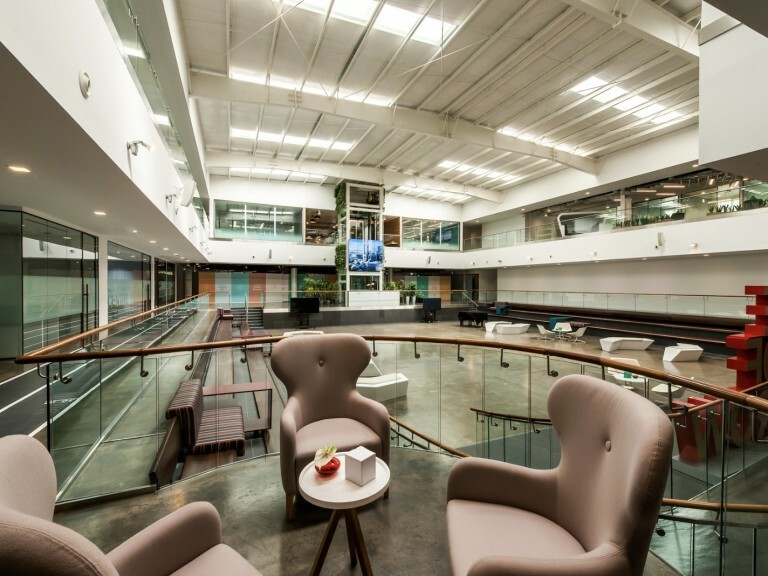 A huge fine-pitch LED ribbon display has the appearance of a halo above and around a soft seating lounge area, where customers wait to speak with customer service. 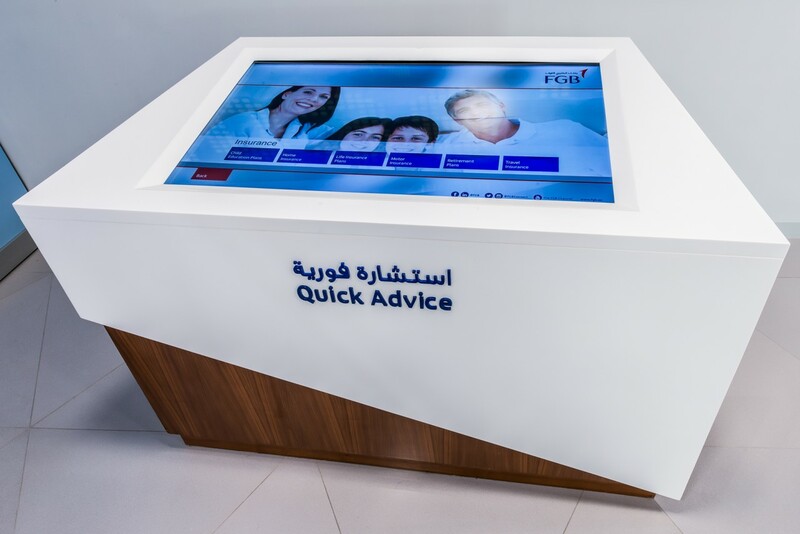 That area also has interactive touchscreen tables available to customers to research bank products and services as they wait for appointments.